There has never been a face quite like that of Giulietta Masina. Her husband, the legendary Federico Fellini, directs her as Gelsomina in La Strada, the film that launched them both to international stardom. Gelsomina is sold by her mother into the employ of Zampanò (Anthony Quinn), a brutal strongman. When Zampanò encounters an old rival in highwire artist the Fool (Richard Basehart), his fury is provoked to its breaking point. 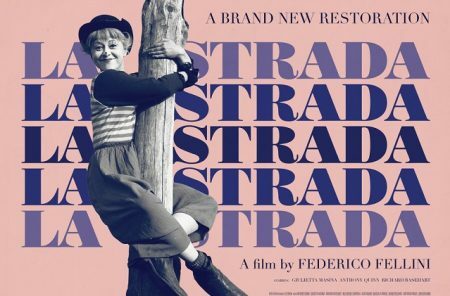 With La Strada, Fellini left behind the familiar signposts of Italian neorealism for a poetic fable of love and cruelty, evoking brilliant performances and winning the hearts of audiences and critics worldwide. La Strada, won an Academy Award for Best Foreign Film in 1956. Tulane Italian professor, Michael Syrimis will introduce the film.